True Nutrition's Leucine 4:1:1 offers more leucine than ever before, providing four parts Leucine to one part Isoleucine and Valine in this powerful Branched Chain Amino Acid formula. 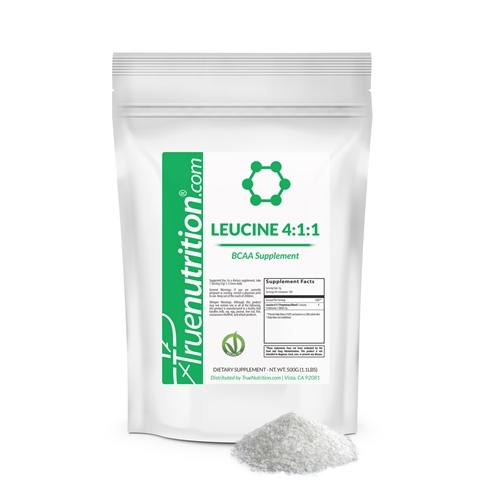 As a dietary supplement, Branched Chain Amino Acids may help to support increased muscle metabolism and increased energy production, making them an ideal recovery aid following intense exercise.✝ True Nutrition's Leucine 4:1:1 is derived from fermented plant-based ingredients, and is entirely vegan-friendly! When I lift weights in the morning, I do it in a fasted state. I feel like this supplement helps me maintain my strength for each workout without having to eat food beforehand. Beware though, the leucine has a pretty strong, bitter taste so I mix it with the TrueLemon flavor packets in my shaker and it masks the BCAA taste nicely.